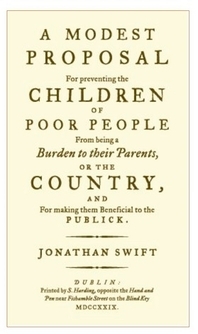 JewishWorldReview.com | JONATHAN SWIFT was being satirical when he penned his "modest proposal" that destitute Irish parents alleviate their financial woes by selling their children as delicacies for rich landowners. He assured his readers that 1-year-olds are delicious, "whether stewed, roasted, baked, or boiled." That was satire circa 1729. Imagine what Swift at his most scathing would write today - say, a 21st-century "modest proposal" to use unborn fetuses for renewable energy. "The bodies of thousands of aborted and miscarried babies were incinerated as clinical waste, with some even used to heat hospitals, an investigation has found. Ten [National Health Service] trusts have admitted burning fetal remains alongside other rubbish while two others used the bodies in 'waste-to-energy' plants which generate power for heat. . . . At least 15,500 fetal remains were incinerated by 27 NHS trusts over the last two years alone, Channel 4's 'Dispatches' discovered." At Addenbrooke's, a hospital in Cambridge, England, the fetuses from 797 miscarriages and abortions were burned in a facility designed to generate electricity and heat. Releases given to the women by the hospital had specified only that the remains would be "cremated." Elsewhere, according to the Channel 4 broadcast that broke the story, hospital staff were more candid. After suffering a miscarriage, 35-year-old Cathryn Hurley recalled in an interview, she asked the nurse what would happen to the baby she had just lost. She was told it would be incinerated with the rest of the day's clinical waste. "That was really difficult to hear," said Hurley, her voice trembling. "Because to me, it wasn't the day's waste. It was my baby. It would have been nice to have some kind of choice about it - to, kind of, mark that baby's life - and there was nothing within the hospital that gave us that opportunity." The expos� set off a furor, and British officials quickly condemned the practice. Clearly, the thought of burning unborn babies to heat hospitals horrifies many people. But just as clearly it doesn't horrify everyone, or there would have been no scandal to expose. An Addenbrooke's spokesman told the Daily Mail that the hospital used to dispose of fetal remains in dignity at the Cambridge City Crematorium. It decided to switch to its own main incinerator - the same one it uses to burn trash and recover energy - when the crematorium raised its prices. Hospital managers were facing budgetary pressures, and needed to be "careful with the use of limited resources." From a strictly utilitarian point of view, why not? Not only did the hospital save �18.50 per cremation, it helped cut energy costs as well. It doesn't make any difference to the fetus how it's disposed of. Why should it make a difference to us? The answer used to be self-evident: Human beings are more than mere flesh, more than just one organism among all other organisms. Death doesn't transform us into "clinical waste," suitable for recycling or fueling an industrial heating system. Human beings have moral agency; that is what elevates us above every other creature. It is why human rights are intrinsic and universal, it is why human life must be treated with dignity - and why human remains must be handled with dignity when we die. And yes, it's why even the remains of an unborn baby should be treated respectfully. But we live a dehumanizing age. Our culture makes it easy to scoff at the quaint notion that in every human being is a spark of something divine. It requires a determined pushback not to grow jaded or callous, or to let human exceptionalism be reduced to little more than market value or a bundle of appetites. The renowned Princeton philosopher Peter Singer was asked a few years ago to identify a value today that will vanish within the next few decades. His answer: "The sanctity of life." He looked forward to the day when only a handful of eccentrics will "defend the view that every human life, from conception to death, is sacrosanct." That, in Singer's view, will mark an advance. The same influential thinker argues that there is nothing inherently wrong with breeding children in order to harvest their organs, or with permitting disabled infants to be killed for up to a month after birth. Anything can be rationalized, including the money-saving convenience of heating hospitals with dead fetuses. Our humaneness is rarely more than a thin veneer, and it takes less effort than most of us realize to peel it off, releasing the barbarism beneath.